Life inTentsSM (www.LifeinTents.com), a full-service tent “glamping” service company that puts comfort and connection at the heart of their operation, has established its Headquarters in Portland, Oregon. Life inTents specializes in creating comfortable, temporary outdoor accommodations in desirable but remote locations. This new West Coast base of operation reflects the growing demand for fun and stress-free outdoor hospitality at “off-grid” festivals, wellness retreats, reunions and weddings. Portland, OR, April 11, 2019 --(PR.com)-- Life inTents pitches their new “tent” in Portland. 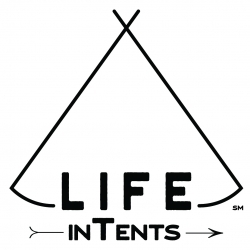 Life inTentsSM, a full-service tent “glamping” service company that puts comfort and connection at the heart of their operation, has established its Headquarters in Portland, Oregon. Life inTents specializes in creating comfortable, temporary outdoor accommodations in desirable but remote locations. This new West Coast base of operation reflects the growing demand for fun and stress-free outdoor hospitality at “off-grid” festivals, wellness retreats, reunions and weddings. The company, established in 2016, began by renting vintage camping trailers and campervans and is now focusing on creating pop-up group campout villages. Life inTents sets up and furnishes spacious canvas bell tents where traditional hotels and B&Bs aren't conveniently accessible. Their central goal is to help guests disconnect from technology and the stresses of everyday and reconnect with each other and the natural beauty of nature by eliminating the worry and work of camp set-up. The Life inTents menu of services for both the avid or non-experienced camper includes the set-up of fully furnished canvas bell tents for sleeping or just lounging. The tent furnishings include: foam queen beds, woven rugs, chairs, end tables, lanterns, pillows, sheets, blankets, and more. For more information regarding tailoring special outdoor hospitality events to meet specific needs can be found at our website. Based in Portland, Ore., Life inTents is an outdoor hospitality company that provides pop-up tent glamping experiences for a wide range of events including weddings, festivals, retreats, and backyard sleepovers. In keeping with the mission of living life with intent and enthusiasm by connecting people with each other and with nature, the company handles all aspects of creating life-affirming and positive life-long memorable experiences for guests and customers who want to temporarily disconnect from technology to reconnect with intention. Life inTents is an outdoor hospitality company that provides pop-up tent glamping experiences for a wide range of events including weddings, festivals, retreats, and backyard sleepovers.